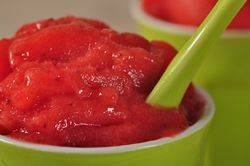 Strawberry Sorbet: Place the sugar and water in a small saucepan, over low heat, and stir until the sugar is completely dissolved (about 3-5 minutes). Boil the mixture for one minute then remove from heat. Pour the sugar syrup into a heatproof container, and place in the refrigerator until completely chilled (about an hour or so). Note: If you do not have an ice cream machine, then pour the mixture into a 8 inch (20 cm) or 9 inch (23 cm) stainless steel pan (sorbets will freeze faster in stainless steel), cover with plastic wrap, and place in the freezer. When the sorbet is completely frozen (3 to 4 hours), remove from freezer and let stand at room temperature until partially thawed. Transfer the partially thawed sorbet to the food processor, and process to break up the large ice crystals that have formed on the sorbet. (This step is what gives the sorbet its wonderful fluffy texture.) Place the sorbet back into the pan and refreeze for at least three hours, and up to several days. Note: If you taste the sorbet after freezing and find the amount of sugar is not right, adjust the level of sugar by adding a little sugar syrup (too little sugar in sorbet) or water (too much sugar in sorbet) and then refreeze the sorbet. The sorbet is not affected by thawing and refreezing.